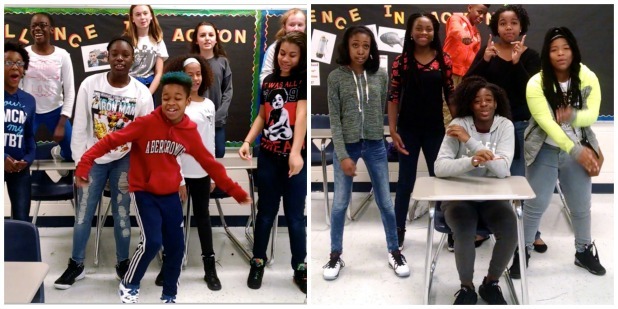 Seventh-grade gifted English students at Bennett’s Mill Middle got five seconds of national fame during a Friday Week-in-Rap Shout-Out sponsored by Flocabulary, a creator of educational hip-hop videos, interactive activities, and online assessments for students in grades K-12. English teacher Carol Saboda had been using Flocabulary in her classroom, and noticed the weekly contest while she and her students were watching “The Week in Rap,” a collection of videos that rap the current events making headlines for that week. Since her seventh-grade gifted classes were studying poetry, she decided to give it a try to see if it would make learning the elements of poetry (rhythm, rhyme, off-rhyme, alliteration, onomatopoeia, etc.) more relevant for the students. Students in her two classes, 33 total, worked on a class rap, and each class submitted a six-line rap, as well as video of the it, for the competition. In preparation, the students looked at the prominent news stories of 2015, and then did some additional research to learn more about the issue. Saboda’s second-period class focused on the upcoming Presidential election, while the third-period class chose the Black Lives Matter movement. “I cannot tell you how the concepts of poetry came alive for them as they laid down those lines. My students are not going to forget this experience any time soon,” said Saboda. Contestants have one week to submit their entries. Only one winner is selected each week based on the entry’s creativity, topical relevance and educational relevance. Winners receive a five-second “Shout-Out” for their school at the beginning of Friday’s Week-in-Rap video. The “Shout-Out” to Bennett’s Mill Middle occurred Friday, January 15, 2016 during “The Week in Rap” on www.flocabularycom.